As an aside, roasting a pumpkin is one of the easiest things in the world: no peeling, no de-seeding, just put the whole thing on a baking sheet in a 350 oven for about an hour or so, or until it’s soft when you poke it with a knife. Let it cool, pull of the stem, peel off the skin, scoop out the seeds, that are no longer impossibly slimy and hard to grab. Genius. I also had a lone piece of pancetta leftover from some risotto the other night. Knowing that I had these three things led me to soup. This afternoon, I picked up some chicken thighs (on the bone, with the skin gives the best flavor and it’s cheapest, to boot) to poach. I had a tamalada over the weekend and had a bit (kind of an understatement) of extra masa leftover and wanted to make some chicken and chile tamales to freeze. I figured poaching instead of roasting them would give me some stock to use for my soup. Bonus. In the fifteen minutes before a friend came over for an afternoon visit, I tossed the thighs in a really hot sauce pot with a little vegetable oil. I seared them skin side down until they were brown, didn’t bother to flip them, covered them with about eight cups of water, a stalk of celery, four whole sad looking green onions, a teaspoon of whole coriander seeds, three crushed juniper berries, a bay leaf and some salt and pepper. I brought it to a boil, turned it down to a low simmer and forgot about it until company had left and it was time to make dinner. While the stock was coming to a boil, I turned on the oven to 350F, peeled and chopped up the rest of the butternut squash and put it on a baking sheet with olive oil and salt and pepper. When the timer dinged after forty five minutes of roasting (I remembered to stir once while the pieces were roasting), all I did was turn off the oven and keep chatting. When Hades came home, I strained (i.e., took out the chicken and did my best to get all the whole coriander seeds out of) the stock. I scraped in the butternut squash from the baking sheet and chucked in about a quarter of the whole pumpkin from the ziploc in the bottom drawer of the fridge. It looked like the soup would be thin with all that stock. But I pulled out the stick mixer and pureed it anyway until it was smooth and then tasted it. It wasn’t at all thin. It needed some salt and an herb. I snipped off a stem of rosemary that I had replanted over the weekend in an old ball jar with a crack (perfect for drainage!) to overwinter in my kitchen window. I rinsed the sprig and tossed in the pot to let it infuse while I rinsed the stick mixer, rearranged the dishwasher, gave some advice on a computer game, pulled out bowls, tossed a bottle of white in the freezer and heated up the crab cakes (two minutes in the microwave). I added a tablespoon of butter and a splash of whole milk (it’s always Snowville around here) to the soup. Dinner was more or less served with just about no effort on my part. It never took my whole attention for more than twenty minutes. And that twenty minutes was divided over the span of a couple of hours. Which made the effort feel even less of a chore. Hades loved the soup. I’m pleased to say that it reminded him of some of the best soup he ever ate while he lived in England. Cherub drank a big serving from a mug. 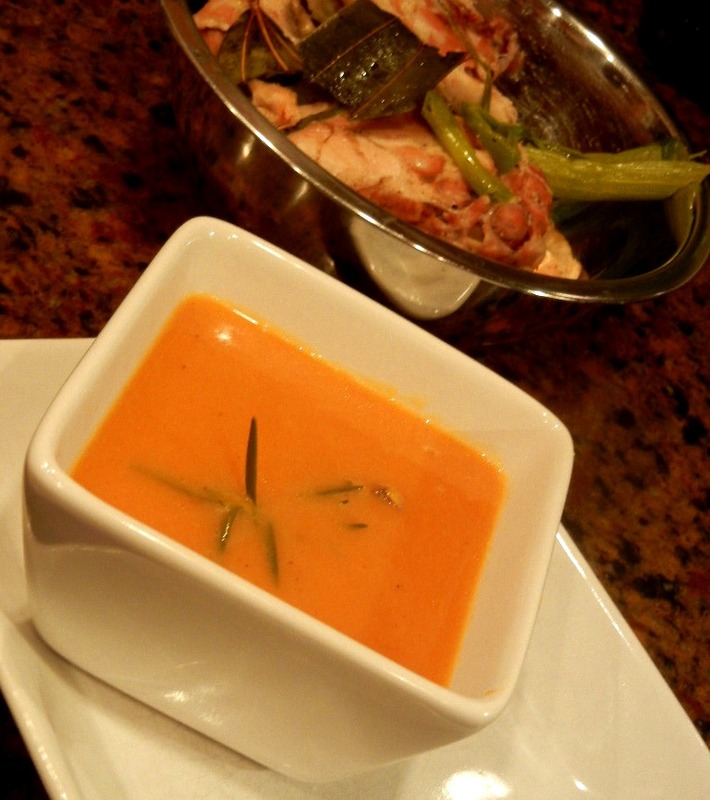 It was one of the best tasting soups I had made, perhaps ever. And did you notice? I forgot the pancetta. Because sometimes that’s the way it goes. Perhaps that made the soup even better. Who knows? It was still easy. I keep saying it, because it’s true. Thinking frugally, breaking up tasks over several days and keeping an open mind about how to use the parts, pieces and ingredients that you end up with is what makes weeknight dinners simple. It becomes second nature. It requires practice. But your family will thank you for practicing. And they will reward you with requests for seconds and clean plates. Playlist included Home, covered by Edward Sharpe & The Magnetic Zeros. You are wonderful. I have seen this in action and am continually impressed by how you pull it all together. Amazing. Love it! And I wrote my post tonight before I read yours…but clearly our minds are in the same place.